A group of North and South Korean divided families were briefly reunited for two hours at Mount Kumgang on Friday, where the second round of three-day temporary reunions kicked off this week. 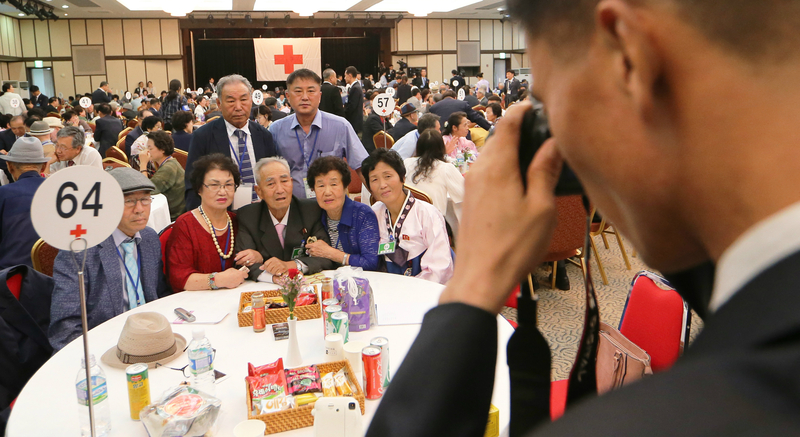 A total of 326 South Koreans and 81 long-separated North Korean family members met each other at a reunion center on the northern side of the border from 1515 local time, followed by a banquet with food and drinks provided by the Seoul side. The oldest South Korean participant at the event, a 100-year-old woman named Kang Jeong-ok, met with her 85-year-old North Korean sister Kang Jung Hwa there, Korea press corps at the event said. “If we meet again and meet in the future, I will get used to it, but we met for the first time [in a long time] today,” Jeong-ok said in remarks carried in pool reports. “You just can’t believe it,” Jung Hwa responded. “Dear Jung Hwa, Jung Hwa, Jung Hwa, I should hug you. 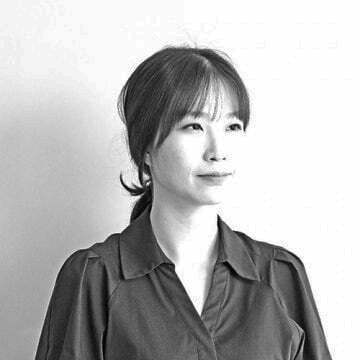 Thank you, Jung Hwa,” Jeong-ok said, calling her sister’s name out several times. 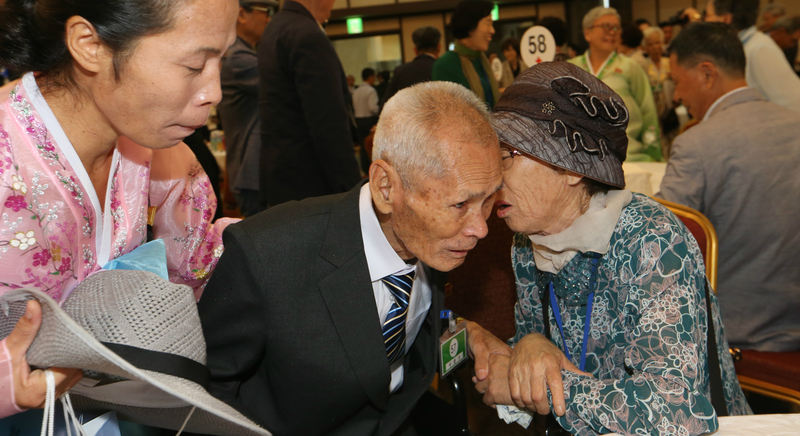 There was also a sole case at the event where a parent was reunited for the first time with a child they had never seen because of the war, with the 88-year-old North Korean Jo Duk Yong meeting his 67-year-old South Korean son Jeong-gi after a separation of more than six decades. “I never dreamt that you were still alive,” Jeong-gi told his father. Jeong’s mother was separated from his father while still pregnant during the war. But despite their separation, she continued waiting for her husband for 68 more years, tragically dying about two months before Jeong-gi was notified by the Korean Red Cross that his father was still alive in the North. 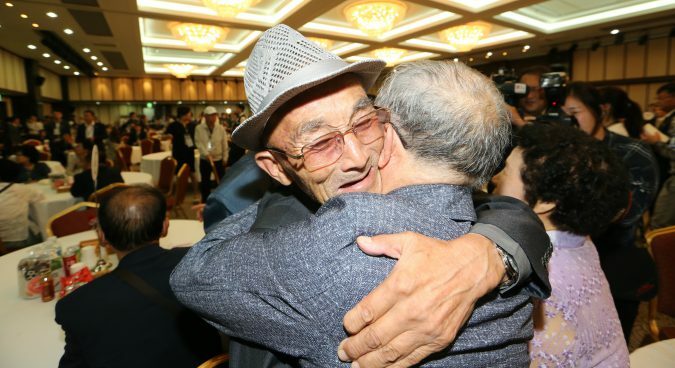 Another case involved what emerged to be a families’ second reunion event, when 75-year-old Song Yu-jin met his 70-year-old North Korean brother Song Yu Chol for the first time in around 20 years. He had met his mother, brother, and younger sisters in Pyongyang in the 1990s, but was subsequently imprisoned by South Korean authorities for violating the National Security Act. “Do you remember me? Our mom has passed away,” Yu Chol said as he burst into tears. Yu Chol, who served as a head of research under North Korea’s Kim Chaek University of Technology, notably brought 11 medals to the reunion venue. Likewise, other North Koreans at the event used the reunion to show off their achievements in the North. 84-year-old North Korean Pak Wan Bae, for example, brought 14 medals and two award certificates to the reunions. The late North Korean president Kim Il Sung presented him with an award certificate in 1958, and he was delivered another one at the 5th National Conference of War Veterans held in July this year. 80-year-old An Se Min showed off a photo carried of her aged 19 in the Rodong Sinmun, the main news organ of the ruling Workers’ Party of Korea (WPK). “How could I have done this if I stayed in Seoul?” she told her South Korean relatives. Language barriers, a growing inter-Korean problem arising from more than seven decades of division, sometimes interrupted the proceedings. “Thank you for being alive… Thank you for making our meeting take place,” 79-year-old South Korean Woo Gi-ju told her 86-year-old North Korean sister Ki Bok in tears. Ki Bok answered she was fine when Gi-ju asked if the reunion center was too cold because of air conditioning, but Gi-ju couldn’t understand her at first, according to the Korea press corps. Some of the North Korean support staff shed tears while watching events unfold at the reunion center, occasionally stopping South Korean reporters to allow participants to reunite in a more comfortable environment, pool reporters said. During the three-day reunion event, North and South Korean separated families are scheduled to be reunited for a total of 12 hours, including three hours in private on Saturday. But despite 83 North Korean applicants having been scheduled to meet their South Korean family members at the event, one family from each side reportedly gave up on the reunion. Weather could have impacted the event – with fears that Typhoon Soulik might lead to its rescheduling – but ended up not becoming a problem. 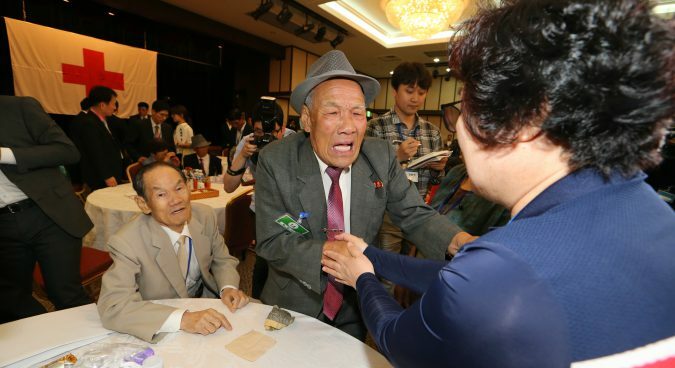 A total of 185 North Koreans and 197 South Koreans, composed of 89 applicants and 108 of their companions, participated in an earlier first round of reunions between Monday and Wednesday this week. This week’s two sets of reunion events are the first of their kind since October 2015, and the 21st to take place since 2000. Subscribe to read the remaining 785 words of this article.